World Record: 5 lbs. 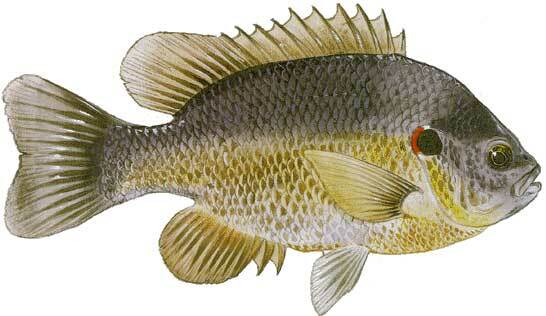 7 ounces, Ga.
349 words are in this fish description. Fish descriptions are reserved for LBF members. Please login now or register for free today. 58 words are in the supplied tips for fishing. These fishing tips are reserved for LBF members. Please login now or register for free today. My fishing experience with these guys is similar to Bluegill. I use small hooks & bottom fish the pond/creek here (Black Creek FL). Preferred bait seems to be worms, crickets, and chicken dogs, though they will hit lures and dough balls. These guys are not as plentiful in the pond as the Bluegill are, but when you catch them, like the Bluegill, they give a pretty good fight on light tackle. My friend and I were fishing a sunfish spawning area and caught several fish over 1lbs on small grasshopper shallow divers. We then moved out deeper and trolled with the same lure and caught the heck out of crappie. 70 to 80 degree water use similar tackle used on trout, slip weight with lightweight line& #6 or smaller hook. Full nightcrawler hooked many times thrown out 15 to 20ft, between the grass to the bottom, where rocky bottom is available. Similar to finding crappie in spring close to shore and rocky bottom. Fish hit agressivly within a minute.